If this was strictly an immigration issue, we wouldn't see white men doing this over and over again, too. Men don't like to be told no. Janise Talton-Jackson was shot dead after rejecting a man's advances at a bar. Caroline Nosal's killer waited for her to get off her shift at work and surprised her by shooting her to death. Lisa Trubnikova, a married lesbian woman, was killed by a man who was completely obsessed with her. Andrea Farrington was shot 3 times in the back by a man that she was "playing." Unfortunately, I could list more. One positive outcome of these horrific cases is they have helped open a dialogue about toxic masculinity, male-on-female crime and the inability for men to handle women's rejection. So how come when the killer of Mollie Tibbetts, the subject of a national story about a missing college student, was found to be a man whose advances she rejected, the conversation shifted another way? That would be because the murders of the aforementioned women were all in the country legally. And Christhian Rivera was, allegedly, not. To put it bluntly, blaming this murder on illegal immigration is absurd. If violence against women was a problem because of illegal immigration, there wouldn't be stories like the ones above. There wouldn't be astronomically high rates of domestic violence. Put simply, a lot of women would still be alive if American citizens weren't a problem when it comes to violence against women. If a problem is widespread and persistent without even taking undocumented immigrants into consideration, the problem might lie outside of the realm of the perpetrator's immigration status. 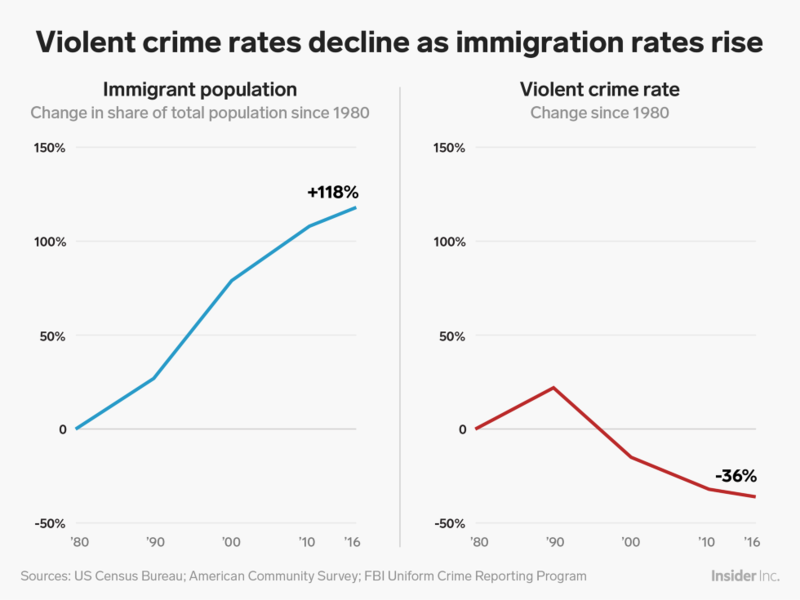 In fact, there really is no association between increased crime and increased undocumented immigrants. According to Dave Mosher at Business Insider, "While tragic individual stories of murder are worthy of public attention and the victims worthy of justice, they are also single trees in a forest of data." The bottom line is this: If Mollie Tibbetts' (and other women who have died at the hands of undocumented immigrants) killer hadn't come to the United States illegally, more than likely, she would still be alive. But that type of "if this, then that" mentality works with every killer, regardless of citizenship. If Janise Talton-Jackson's killer hadn't gone out to the bar that night, she might still be alive. If Caroline Nosal's killer had not gotten a job at that grocery store, she might still be alive. If Lisa Trubkinova had never crossed paths with her obsessed killer, she might still be alive. If Andrea Farrington's killer had chosen to work somewhere else, she might still be alive. Every single woman who has died at the hands of an obsessed stalker, an angry partner, a random rejected stranger, an infatuated coworker, could have missed the situation altogether had something in either of their lives gone differently. Because immigrant or not, your chances of ending up on the wrong end of a terrible situation come down to chance: You were there, they were there. If Mollie Tibbets had chosen a different college, if she had been working that night, even if she chose a different jogging path, this tragic chance encounter may not have happened. If Christhian Rivera had lived in a different state, if he had made plans that night, and yes, if he hadn't come to the United States in the first place, this tragic chance encounter may not have happened. And it wasn't a result of his immigration status, it was a result of a culture where men feel entitled to women's bodies, conversations and time. It was a result of men believing they have a right to a woman, however they please. It was a result of men being unable to handle the rejection of the women they feel entitled to. Any man who gets so angry when a woman rejects his advances that he "blacks out" and murders her might have problems beyond being in the country without documentation. Mollie Tibbetts' death is heartbreaking in every imaginable way. Young college students dying in the prime of their life is sad and frightening and infuriating. But using this tragic situation, one that further demonstrates the dangerous side effects of male entitlement, to further an agenda against immigration is not only unproductive, it is harmful. There isn't an unbalanced epidemic of violence against women from undocumented immigrant men - fighting against an epidemic that simply isn't there is a colossal waste of time. Beyond that, allowing a few select cases to mold your views (and, at the upper-political level, your policies) takes time and resources away from where they should be focused: In this case, violence against women from all races and citizenships statuses. Mollie Tibbetts' might still be alive if her killer didn't come here illegally. But she would also still be alive if he didn't feel entitled to her and her time. And a lot more women would be alive if the latter were true, too.